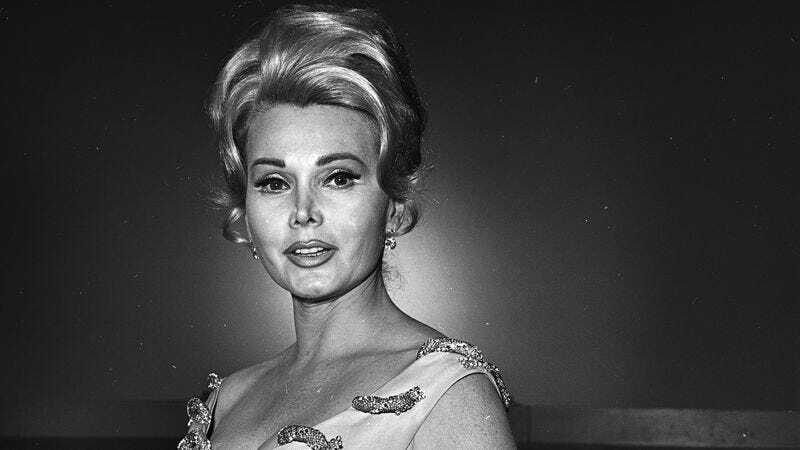 As confirmed by TMZ, legendary celebrity and Hollywood icon Zsa Zsa Gabor has died. She had been on life support for the last five years and suffered a heart attack. She was 99. Though she had a lengthy career as an actor, Gabor was really more famous for essentially being the prototype for today’s “famous for being famous” celebrity culture—a status she openly embraced by frequently playing herself in various shows and movies over the years. These roles would often poke fun at her real life, specifically her many marriages, her fabulous lifestyle, and one infamous incident in the ‘80s in which she slapped a police officer. She never really got the sort of prestigious acting gigs that tend to make people into superstars, appearing on The Facts Of Life, The Red Skelton Hour, Playhouse 90, Bonanza, and Batman, but as Variety also notes, her arrival on the acting scene coincided with the rise of talkshows and game shows that would make frequent use of celebrity guests. This, combined with her large personality, helped make her into a reality TV-esque star decades before the Kardashians or Paris Hilton—her great-great niece—were a thing. The Paris Hilton connection comes from Gabor’s second marriage, which was to hotel magnate Conrad Hilton in 1942. The pair divorced in 1946, but in those years Gabor gave birth to her only daughter, Francesca. She would later marry actor George Sanders, Barbie toy designer Jack Ryan, lawyer Felipe De Alba (their marriage was annulled after one day because her previous marriage hadn’t been properly dissolved), and her much-younger final husband Frédéric Prinz Von Anhalt, who had been accused of keeping Francesca from visiting her mother in recent years. Francesca died from a stroke in 2015, and Anhalt reportedly never told Gabor. Gabor’s final acting roles were cameos as herself in the ‘90s, appearing in A Very Brady Sequel, Cybill, and Empty Nest. She suffered numerous health problems in the last few decades, some stemming from a 2002 car crash that left her partially paralyzed and dependent on a wheelchair. She later suffered multiple strokes, had her leg amputated due to an infection, and more recently got a lung infection from a feeding tube. Gabor would’ve turned 100 on February 6.